Combined heat and power (CHP) systems have long been used to reduce the overall energy intensity of industrial systems. There are two types of combined heat and power, depending on whether the system produces power first, then heat, or heat first, then power. In topping cycles, the hot exhaust of an electricity generator such as a natural gas turbine or reciprocating engine is used to provide process heat, hot water, or space heating for the site. According to preliminary 2015 data, topping cycles are used by 89% of total CHP capacity. In bottoming cycles, also referred to as waste heat to power, wasted heat from a furnace or other high-temperature industrial processes is recovered and used for power production. Bottoming cycles typically use waste heat boilers or steam turbine systems. Ongoing research, development, and deployment efforts are focused on these systems as a way to reduce wasted heat and increase industrial energy efficiency. Bottoming cycles are mostly used in industrial facilities in the chemical, paper, and primary metals sectors, as these industries often have high-temperature waste streams that are favorable for waste heat recovery. As much as 20% to 50% of the energy consumed in some industrial processes is ultimately lost through waste heat contained in streams of hot exhaust gas and liquids and through heat conduction, convection, and radiation from hot equipment surfaces and heated product streams. The overall energy efficiency of some industrial processes can be improved by capturing and reusing the waste heat. In some cases, such as industrial furnaces, efficiency improvements resulting from waste heat recovery can improve energy efficiency 10%–50%. A study by the U.S. Department of Energy's Energy Efficiency and Renewable Energy office identified research, development, and demonstration efforts to expand waste heat recovery practices in the U.S. industrial sector. The waste steams analyzed in this study showed that roughly 60% of unrecovered waste heat is low quality (i.e., temperatures below 450 degrees Fahrenheit). According to the study, the greatest potential for expanding bottoming-cycle CHP is in energy-intensive industries, such as iron and steel, glass, and cement. 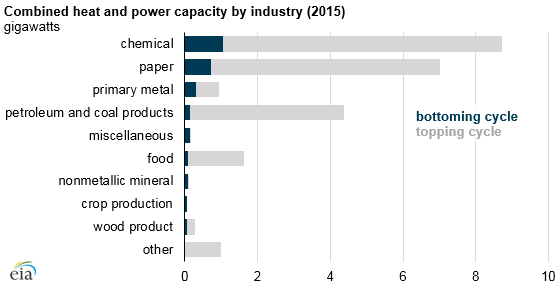 These industries have high-temperature waste streams that can provide the input to generate electricity. Technological advances that allow the use of lower temperature waste streams can increase the potential for bottoming-cycle CHP. These new technologies with lower temperature requirements can also help to expand the bottoming cycle for nonenergy-intensive industries such as wood products, transportation equipment, and fabricated metal products. Determining the applicability of the bottoming cycle requires more complex analysis than the topping cycle. One approach, called pinch analysis, examines the temperature and heat flow rates of hot and cold streams and attempts to optimize the heat exchange between streams. Even though effectively implementing bottoming-cycle CHP is complex, the energy that is converted to electricity would otherwise be wasted. More efficient use of waste heat would also reduce the need for other purchased fuels. More information is available in the EIA Discussion Paper, CHP Industrial Bottoming and Topping Cycle with EIA Survey Data.